Today EA announced a new subscription service for the Xbox One that will give customers unlimited access to a handful of the company's games for $4.99 a month. It's called "EA Access," and sounds like a sort of Netflix-style program for the company's games. 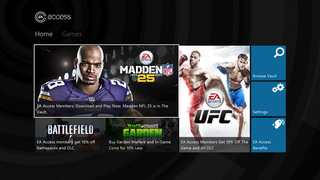 For a $4.99 monthly fee, subscribers will get access to a library of EA games the company is calling "The Vault." The announcement didn't go into much detail about what games will be included in this collection. To start, EA said that it will offer four main games, all of which were released in 2013 or early 2014: FIFA 14, Peggle 2, Madden NFL 25, and Battlefield 4. Additionally, subscribers will receive a ten percent discount when purchasing any and all EA "digital content" on the Xbox One. That includes full games like Dragon Age: Inquisition and premium services like Battlefield 4 Premium. Oh, and one more thing: EA Access subscribers will get early access to upcoming titles "up to five days before the release date." Microsoft's Major Nelson said in a blog post that "you'll be able to try the game for at least two hours and then save your progress" during this pre-release period. The EA Access Twitter account later added: "You'll never have less than 2 hours, but each trial is different & will often be longer" in response to a question about the time window for these early demos. The service will cost $4.99 on a month-to-month basis or $29.99 for a full year's subscription.